yellow will compliment each other nicely for both boys and girls. nicely on the bright paper. -Gold or pastel yellow tablecloth. -Pastel colored baby shower or Mardi Gras confetti or strands of beads. colored tablecloth at each table to add variety throughout the room. dark purple tableware for one table. -Matching streamers, balloons, and other mardi gras decor. tablecloth that matches all the colors in the room. ribbon tied on the ends. –Clear bowls filled with mardi gras beads. -Plush teddy bears or dolls with mardi gras masks on the face. Use a different colored strand of mardi gras beads around each tier. Attach purple, green and gold (or pastels) baby items around the cake. Top the cake with a cute mask. with the mardi gras colors. 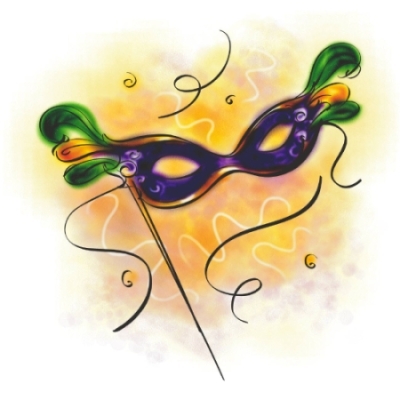 -Mardi Gras masks on sticks with a personalized ribbon. -Chocolates wrapped in mardi gras colored foil. blanket.,br>-Mardi Gras keepsake box for the parents. and/or baby with a mardi gras backdrop.